The plant and equipment were procured from Belarus following initiatives by President Mnangagwa when he visited that country in 2015 as Vice President. The shift to conglomerate mining is expected to change the face of the diamond industry. "I am excited that this event marks a welcome turn of fortunes for the diamond industry in Zimbabwe. It is a sign of reassurance that the investment the Government made is creating the desired capacity to unlock maximum diamond value and its contribution to the socio-economic development of our great country," said President Mnangagwa. He said the commissioning of the plant was in line with ZCDC's vision to be among the top five producers of rough diamonds in the world. "In line with the national vision of increasing production across all sectors, I am advised that ZCDC has a vision to be among the top five producers of rough diamonds in the world in the next five years, with annual production of around 10 million carats. Thus the commissioning of this conglomerate crushing plant, with a capacity to produce around 650 000 carats per month at full capacity, augurs well with this vision," the President said. He urged the company to use the plant to raise productivity. "The nation has huge expectations of the diamond sector to significantly contribute to our economic recovery and growth. You therefore have the onerous burden to deliver in the shortest possible time." President Mnangagwa said the Government recently launched a diamond policy to improve confidence and build capacity in the sector. "I have been briefed that the company has been producing and is working on improving the pricing structure through various value management strategies. "To this end, it is commendable that the ZCDC launched an online diamond bidding system in October which resonates with our 'ease of doing business' reforms and current technological trends in the diamond industry," added President Mnangagwa. He said Government was optimistic ZCDC would finalise its sales and marketing framework. "Meanwhile, we remain optimistic that the company can finalise on its sales and marketing framework and resume its sales so that it starts generating the much-needed foreign currency for the nation," said President Mnangagwa. He said the mining industry was one of the main anchors of economic development as outlined in the Transitional Stabilisation Programme and Government's vision to achieve a middle income economy by 2030. "In that regard, we must develop robust strategies within our operations and inculcate contemporary best practices in our mining schools and faculties. I thus challenge stakeholders in the sector to shift their paradigms to be able to fully explore and exploit our vast mineral resources," said President Mnangagwa. He urged the mining sector to promote sustainable livelihoods and protection of the environment. "Relevant authorities and stakeholders must expeditiously harmonise and rationalise various taxes and levies for us to be regionally attractive. This will be a positive step towards attraction of mining investments," said President Mnangagwa. He congratulated the ZCDC for its community social responsibility programmes and urged other companies to do the same. The President said his administration would not brook corruption in the diamond sector. "Transparency, accountability, honesty and integrity are indispensable values for stakeholders in the diamond sector. I am fully aware of the immense susceptibility to theft and corruption by those in the industry," he said. "The Second Republic will not brook or condone any acts of corruption or misappropriation of resources that should benefit all the people of our country. We are the more wiser now and perpetrators will be dealt with severely," said President Mnangagwa. 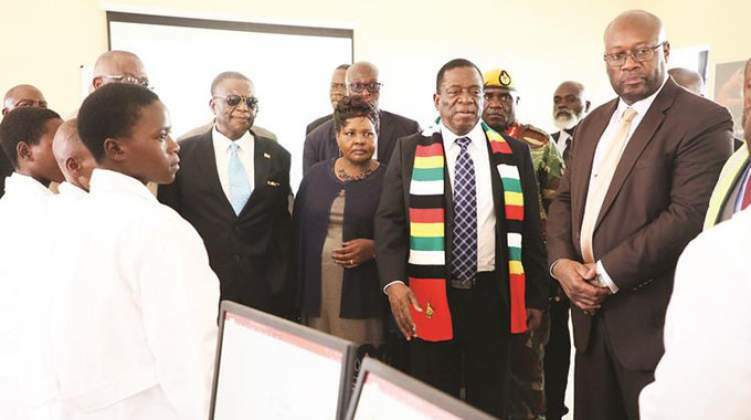 In an interview after commissioning the plant, President Mnangagwa said Zimbabwe was open for business given growth prospects in the mining sector. "We are really open for business with this young man (Mines and Mining Development Minister Winston Chitando) leading my ministry of mines. "We believe the figures he is giving us are conservative and may be double by the time we reach 2023," he said. President Mnangagwa cited lithium as another mineral with great potential to spur economic growth. "Actually, from what I have been briefed, Zimbabwe maybe the eighth producer of lithium in the world but after we open other mines other than in Goromonzi, in Masvingo and Matebeleland North, we are likely to go up the scale. "So the future of this country is bright (and) those who cannot dream will be unfortunate but those, like me, who dream of a beautiful Zimbabwe, I am happy with the dream that Zimbabwe will be great again," President Mnangagwa said. The ceremony was attended by Vice President Constantino Chiwenga and several Cabinet ministers and senior Government officials.